There is all of this data out there measuring the income of celebrities and hedge fund managers, CEOs, and baseball players. Over the years as I have explored data about income I have come across the same problem over and over again: How do I visualize the highest income earners, people who made hundreds of millions (and in the case of hedge fund managers several billion dollars in a given year) along with a typical family's income. 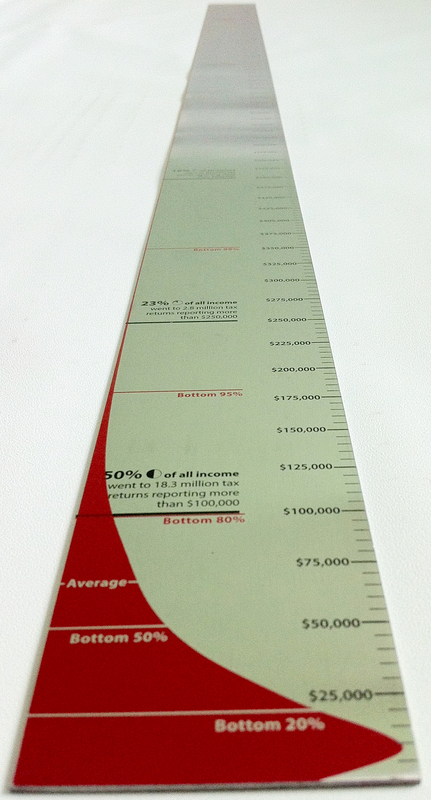 In this project, I created an "Income Yardstick" measuring income inequality in a single year. One side shows what the bottom 99.9% looks like with incomes bellow $1.8 million dollars but flip it over and you see the scale jump to 5 billion. Ten yardsticks were custom made with the 2-color design imprinted on brushed stainless steel, 36" by 2" in size.